Taking a day off the bike to sample the great Oregon outdoors on the water. What can I say? 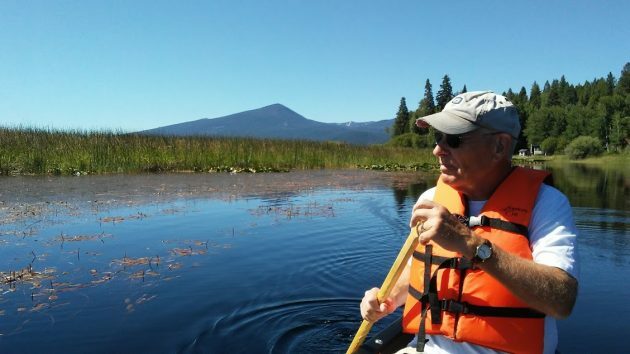 Leaving Albany briefly behind, I took to the wilds of Upper Klamath Lake with my son Dave. And I can report that the canoe trail there provides an experience that is hard to beat. If you like nature, that is. Birds, for example, all kinds of birds from pelicans and eagles to swift little flyers whose names I don’t know. But also beavers and their lodges, and ducks flapping their way out of the reeds when they hear you coming, and fish jumping out of the lake or just poking up their heads. The place is a wildlife refuge, and it certainly shows. From the lake, the surrounding mountains of the southern Cascades seem incredibly far off, even though the actual distance is not that great. Also on the horizon: the ragged rim of Crater Lake. We were on something called the Upper Klamath Canoe Trail. Online I read that it’s 9.5 miles long with four branches. If you follow the trail, you see discreet little wooden signs pointing the way. And if you veer off it, as we did, you best know your bearings to find it again. Or rely on some digital gadget to remind you where you are. The Rocky Point boat launch off the West Side Road is a good place to start. If it’s a nice day, though, better get there early because there are only about half a dozen parking spaces for vehicles and boat trailers. It helps the commentator (below) to have a strong paddler in the bow (above). I want to take this trail with my canoe raft. I have no GPS however, hope it would not be too hard to follow. Looks wonderful. Looks very serene and relaxing. Thanks for writing about your canoe trip. Sure is a tranquil place. Nice place to get away from it all. Thanks for sharing. I lived in K-Falls for a time and enjoyed the lake, mainly; how were the mosquitoes? No bugs at all that day on the water.